I have always found the aesthetic of Warhammer 40k fascinating. The combination of fantasy and dark sci-fi appeals to my very nerdy brain as they are two of my favourite genres. That being said I have never actually played any version of the various table-top incarnations. I’ve admired the miniatures for decades but my hands-on experience with the 40k universe has been strictly through the medium of video games. After a glut of mediocre 40k titles released in the last few years my appetite for 40K has diminished greatly. There are a few gems for sure, but for the most part the games have been unimaginative, or severely lacking in polish, but for me the main issue is that they all kind of merge into a blur of oversized power-armour, neo-gothic architecture, and slavering aliens. It takes something special these days for me to pay attention to this over-fished intellectual property. Mechanicus is one of very few in development Warhammer 40,000 projects I am at all interested in. So, when given the opportunity to preview Bulwark Studios XCOM meets Darkest Dungeon grim-dark strategy game I was quite happy to delve in. fans of the universe’s fiction will adore Counter’s almost poetic metal-spitting pseudo-archaic dialogue. 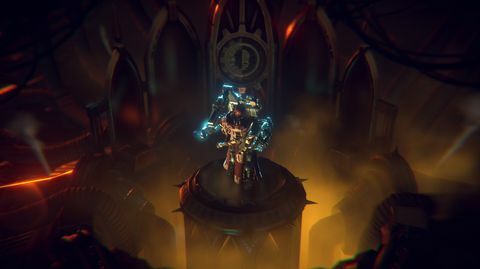 Mechanicus puts you in command of a squadron of The Adeptus Mechanicus. The Imperium of Man’s elite technology obsessed religious order. This technically heretical cult worships the Machine-God rather than the God-Emperor of the Imperium. As anyone who knows anything about The Imperium of Man, heresy is punishable by death. The reason the Adeptus Mechanicus are not only tolerated by the Imperium but embraced is because their monopoly on advanced technology is essential to the survival of the Imperium. That and the Mechanicus’ Tech-Priests have proven not only their loyalty to the God-Emperor but also their excessively brutal effectiveness in countless battles across the galaxy. You play the role one of these Tech-Priests as he commands an elite unit of cybernetic zealots dedicated to the quest of knowledge and the elimination of those that oppose them. 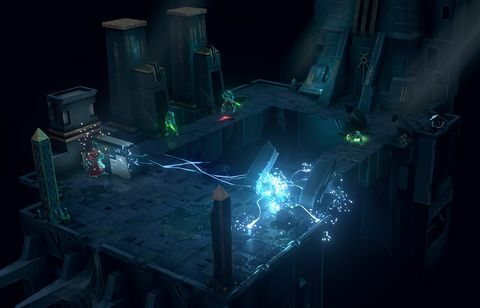 The game itself leverages procedurally generated levels with tactical turn-based combat and a story written by long-time and prolific 40k author Ben Counter. From the very small amount of story content I was able to experience he nails the tone perfectly. Which is fantastic or problematic depending on your opinion of the excessively dramatic proto-Latin language employed by the various characters in the game. I personally have always found this aspect of the 40K universe a little hard to digest, but I am sure fans of the universe’s fiction will adore Counter’s almost poetic metal-spitting pseudo-archaic dialogue. I will not comment on the story at all, except to say it shows a lot of promise. The core of the game is built on three pillars. Unit upgrading and improvement, procedural level exploration, and tactical turn-based combat. The first of these three has always been a massive part of any 40K experience and Mechanicus does not skimp in this area. Each of your Tech-Priests has access to an ever-expanding arsenal of advanced and devastating weaponry as well as various augmentations as you continually purge their weak flesh and replace it with the purity of divine machinery. Bulwark thankfully included some later game missions in the preview build so I could experience some of the more insane upgrades, weapons, and recruitable units available in the latter missions. Careful consideration is needed when outfitting your squad, the more you spend on powering up means you’ll have less to spend on recruiting additional units into your party, and more than once that proved to be the deciding factor in combat as even the most impressive weapon is of limited use when you’re being overrun by enemies. And overrun you will be. 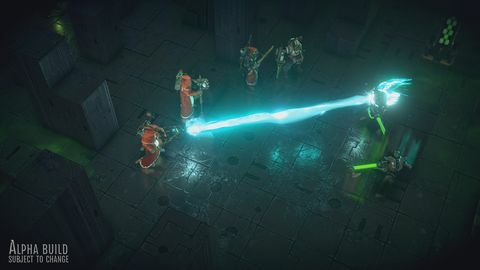 There has been careful consideration about how each of core game pillars interact with each other, and a laser focus on ensuring combat is continuously challenging and rewarding. Exploration in Mechanicus feels very much like that found in Darkest Dungeon. 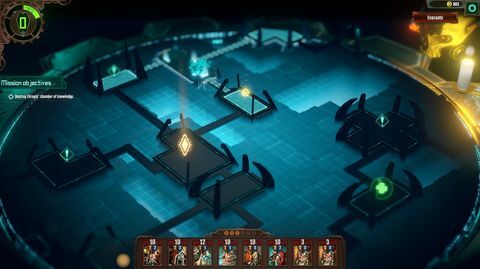 You move your squad from room to room in a procedurally generated crypt where they may or may not encounter enemies or an interactive element of some sort. Early on I was given the opportunity to examine a relic, destroy it, or move on. 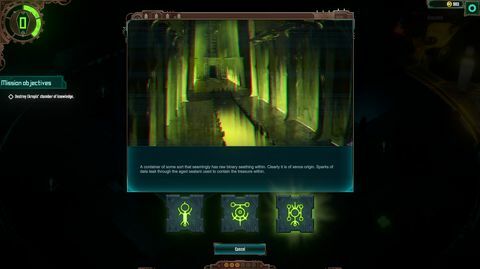 In this case let’s just say that while my curiosity may have given me some insight into my current situation, it also began a sequence of events that would eventually leave me fighting off a hoard of skeletal machines called Necrons that were none too happy to have been woken up. I encountered a few of these light role-playing options throughout my time in the preview, and for the most part they do a great job of not only building out the universe, but also building tension. Your choices have consequences, and some will come back to bite you squarely in your cybernetically enhanced arse. Others though just might save it. An awake Necron is not a friendly Necron so they must be purged. 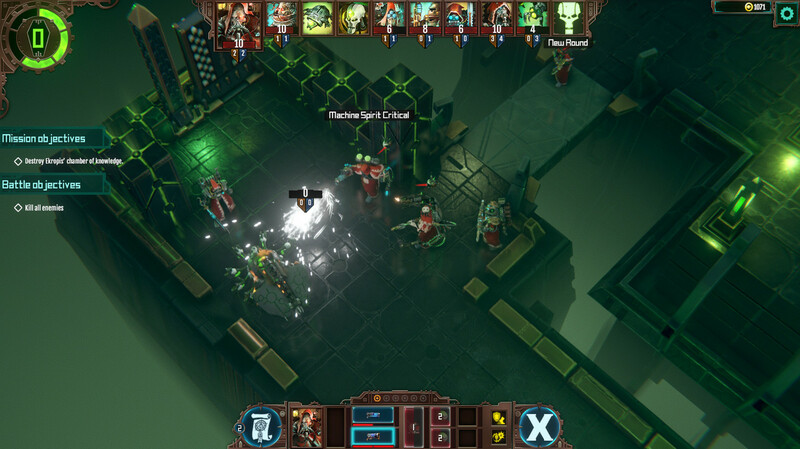 Combat in Mechanicus will feel very familiar to anyone who has played the new XCOM games, but with a couple of nice tweaks to make it feel fresh and different. 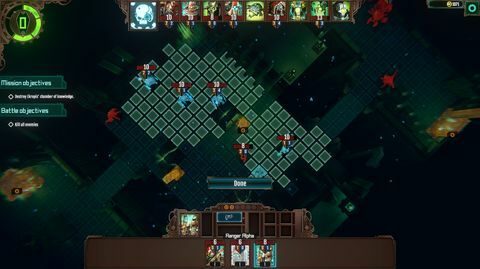 Movement feels very XCOM-esk, the grid and movement range are taken almost wholesale from that system, but Mechanicus adds an action-point (AP) like system called Cognition Points (CP) on top of it. CP can be spent to move further and use weapons or abilities. Much like AP in other turn-based games CP will generate in between turns, but it can also be collected at various points on the battlefield. Collecting additional CP will give the opportunity to pull of a series of moves or attacks in a single turn, or series of turns that you would normally not be able to do and considering you will always be out-numbered that advantage must be exploited smartly or you will face defeat and death. Combat always starts with you just controlling your Tech-Priests, but at the start of the next round you will be given the opportunity to deploy one of your additional recruited units. These range from weak meat-based melee units to mammoth mechanical terrors. How, when, and where these units are placed is vital to managing the threat in each combat scenario. 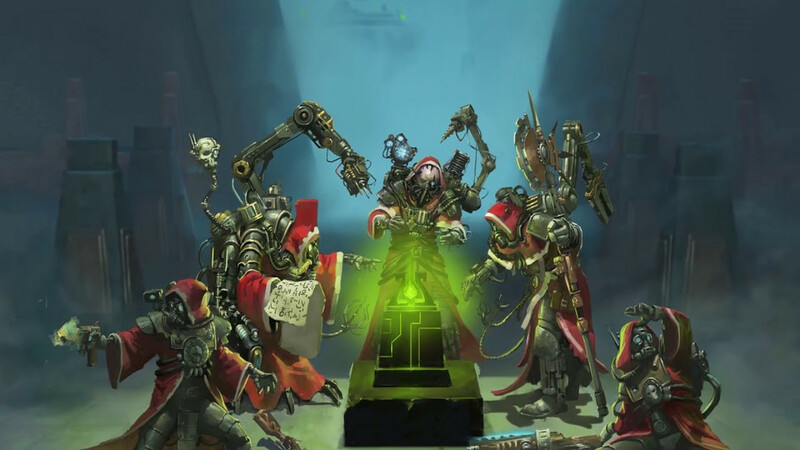 As a result there is far more depth and nuance in Mechanicus than any of the XCOM games the combat system borrows from, but not without sacrificing the immediacy and accessibility of the smartly streamlined system. Previews can be problematic for any reviewer with access to only a limited amount of content and “not final product” caveats in place it can be a difficult proposition to make a definitive statement about the quality of the game when presented in this manner. That being said I had a blast in Mechanicus. 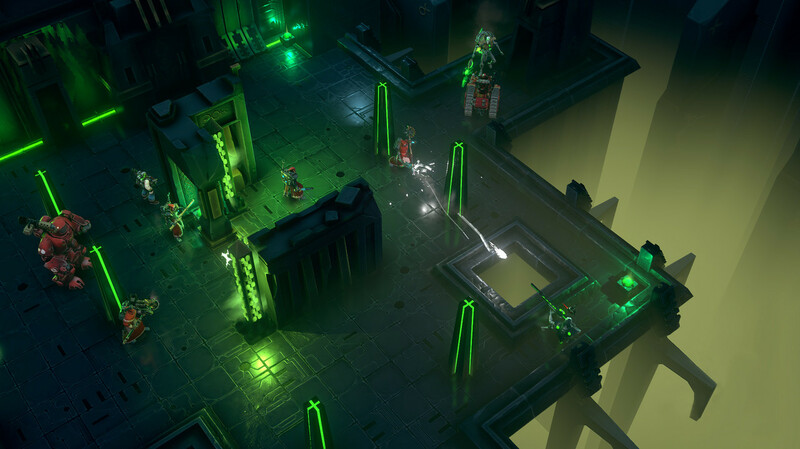 There has been careful consideration about how each of core game pillars interact with each other, and a laser focus on ensuring combat is continuously challenging and rewarding. Unit upgrades look meaningful and in the latter stages suitably ostentatious. The trade-offs needed when choosing between upgrading a unit, equipping an enormously powerful weapon, or recruiting additional back-up feels meaningful without being mean. My initial fears that there being only one enemy race would limit variety were quickly erased. Not only are they beautifully designed, but there are more than enough different types with increasing threat-levels and abilities to keep you constantly needing to change and evolve your strategies. In short, I have no complaints aside from some purely subjective issues with some of the dialogue. Something any fan of the 40K universe will have no problem with at all. The only thing that really stuck out as missing from the preview was something that I thought was not included as it was not yet finished, but turns out is not actually going to be included in the full game. 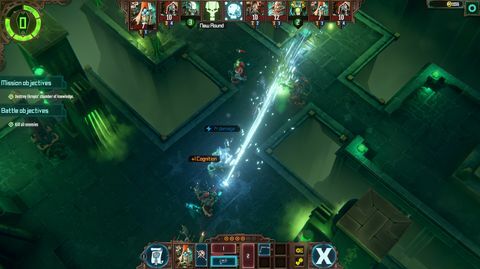 Mechanicus has no co-op or multiplayers modes. It has been designed from the ground up as a single- player only experience. I am sure there will be a lot of disappointed 40K fans out there as a result, but for single player gamers like myself, that focus on delivering a solid solo experience looks to be paying off. 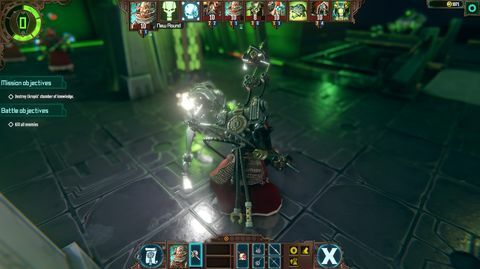 As a result, Mechanicus may be one of the best Warhammer 40,000 games we’ve seen to date. I am looking forward to spending more time with the full game when it releases next month.